I looked in my photo archives a while back and checked out a picture of Mt. 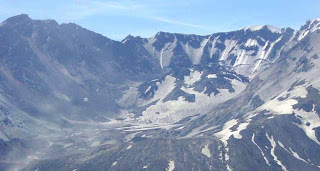 St. Helens I took in 2001. The 1986 dome in the crater is some 900 feet high, and in 15 years, it had not changed much. I flipped to a picture I took in 2006. A huge new dome was there. It was growing at a rate of thousands of cubic feet per day between 2004 and 2008. Hour by hour, it didn’t change much, and day by day it looked no different, but over the weeks and months it got bigger and bigger. Every so often, a flank collapsed, causing an explosion, and sending ash plumes high into the atmosphere. Most of the time geologic change is very slow, but sometimes it is very fast. Mountains have appeared on Earth during our lifetimes! I love teaching about geology. I love it because I am fascinated by the beauty of crystals, the grandeur of earth history, the strangeness of the many animals that have lived on the earth, and I love understanding how a landscape came to be, whether from flowing water, grinding ice, or surging lava. For years, I have looked forward to teaching, just for the joy of opening new worlds to my students. But there are also serious issues that have to be dealt with. I started teaching three wars ago, all of them in the Middle East, and two of them, despite all of the various justifications for fighting a war, on lands situated over hundreds of billions of barrels of petroleum. I worry about a society that ignores the scarcity of resources, hardly giving a thought to where their gasoline is coming from. A vanishingly small percentage of the population bears the burden of fighting the wars, while our society does little to prepare for the time when fossil fuels run short. The stakes are high. We are running out of easy oil, despite the changes brought about by the dangerous process of fracking. The fossil fuels that we are burning are building up the carbon dioxide in our atmosphere, and the Earth is warming up, far faster than the predictions made by climatologists. As the price of energy continues to rise, we as a society will finally have to confront the choices that have to be made about our energy future. We have to confront the very real effects of climate change, in drought, flooding, increasingly intense super-storms, sea level rise, and loss of glacial ice worldwide. Who will be making those decisions?